and isn’t expected to live beyond the end of the year. 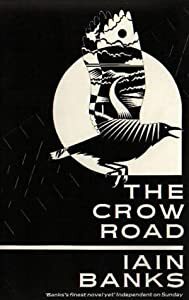 My previous post talked about my five favourite books and just nudging the outside of those is ‘The Crow Road‘. I adore this book, bought on a whim on a vague recollection of the TV series and loved ever since. It starts with the awesome opening line ‘It was the day my grandmother exploded’ and just gets better from there. The characters are fantastically well drawn and though the plot line could seem fantastical, it never turns into a crazy melodrama. The dialogue is particularly good. If you want to write believable, funny dialogue that builds the character and plot look no further than this gem. It’s very sad to think that the author of this masterpiece will soon be ‘away the crow road’ himself. He’s a true great of modern writing and if you haven’t picked up one of his novels yet, I urge you to do so. sad news indeed! i know all our hearts go out to Mr. Blanks and his family. thanks for letting us all know so we can support him as a community.